While planning our honeymoon we considered many of the usual destinations, Mexico, Dominican, Cuba etc. The issue was, he’s well travelled and I’m not. So when suggesting places the response was always positive from my husband, because he’d been there before and enjoyed it, but I wanted our honeymoon to be something exciting and new for both of us. This led us to the one continent neither of us had set foot on – Asia. After looking at a few options, I quickly set my heart on Bali, a relaxed Island in Indonesia, with lots to do and see. Considering this would probably be the longest and most extravagant holiday I ever embark upon, we decided to go all out and make sure this was extra special. Not wanting to miss out on anything, we filled our trip with as much as possible, including making our flight change into a two-night short stay en route opting for Hong Kong as our mini city break. As for Bali, we split our stay into two main parts. First, we would arrive and spend three-nights in one of the most luxurious hotels we could find. This would be our main honeymoon destination, a place where we could be the only people in the world, and experience pure indulgence. After that, we would spend six nights travelling around the island, visiting many of the different sights, and experiencing as much as possible. We arrived in Bali and were greeted by our driver who would take us to our first hotel, the W Bali. The drive was pleasant but we could tell that Seminyak was a very congested area of the island. While Bali may draw in many tourists, the local roads were not quite ready for the increase in people and we spent a long time stuck in heavy traffic before arriving at the W Hotel. All this disappeared on arrival, as we drove down the private driveway to the hotel reception, I was very impressed with our main hotel choice. We had booked the marvellous one-bedroom pool villa, and it was heaven. A private suite with huge king size bed, lounge area, bathroom with a bath that actually fits two people in it, a sun deck with lounges and double day bed, and lastly, a private pool. Normally you look at photos on a hotel website and assume it’s creative photography or enhanced in some way, but not this place. Our suite could have been lifted right out of the brochure, and it was amazing. The food in the hotel was also fantastic. Each morning we picked whatever we wanted from the menu, and always followed up with a breakfast pudding of either waffles or pancakes with ice cream. The main pool could get quite busy, as in you might not get the best lounge spot if you weren’t early, but it wasn’t crowded, and if you grabbed a lounger by the beach you could sit and watch the waves crashing in for hours. While it’s not advisable to swim in the ocean here due to the currents, it’s highly relaxing just to sit and stare out into the sea. If that’s not your thing you can opt for a dip in the pool where the staff will bring you cocktails or snacks on request. On top of this, there was just an incredible attention to detail. The staff were super polite and attentive, the place was spotless, constantly being cleaned, and the food and drink were top notch. Add this all together and I spent three days in constant heaven. If I could, I would go back there in a heartbeat. We visited two restaurants in the area on the first few nights, and also spent one night in the hotel. Our first meal was at Bambu, a relaxed but romantic restaurant serving authentic Balinese cuisine. We loved both the food and the atmosphere here, and would highly recommend a visit if you’re in the neighbourhood. Our second was La Lucciola, a restaurant mixing Mediterranean flair with a touch of Asian spice. Unfortunately, despite its good reputation, we didn;t enjoy the food here quite as much. The dishes seemed to lack the flavour we had experienced elsewhere, and it also cost us quite a bit more than the previous night at Bambu, so we left disappointed. For our last night, we chose to stay in the hotel rather than venture out. La Lucciola had put us off a little and at least here we knew the food was really good. We booked a table at Starfish Bloo for some pan-Asian cuisine and followed up with cocktails in the Ice Bar for a relaxing final night. While the price is a little higher here than the local establishments, we were happy to spend more to know we would enjoy our final night of luxury. The W Bali was an amazing experience for me, and one I hope but doubt I will ever repeat. This is exactly what I expected my honeymoon to be, and I would definitely recommend this place if you’re looking for something special. After our stay at the W Hotel, we commenced a five-night tour of the Island. We were accompanied by a driver and tour guide for the whole six days, which was great as we really got to know them as the days went by. Thankfully, our local guides were very knowledgeable about the places we visited, an added bonus is that they switched up our itinerary to make it flow smoother. For some reason the tour operator had us doubling back on ourselves, and cramming lots into one day with barely anything the next, so we took their advice and let them reorder everything as they saw fit. It was also easy to switch things up as our tour only had us on it! As we travelled towards Ubud our first stop was Mas, famous for its wood carving and sculptures. In Bali, each village tends to have a trade, and all families who live there learn that particular skill. In Mas, it’s wood carving. In Celuk, it’s silver and gold smithing, with intricate jewellery on offer. Also in the area are many artists, and the Neka Art Museum which displays a selection of works from many Balinese artists or expats whose artwork has been influenced by Bali culture. Our hotel for this section of the trip was the Alaya Ubud, situated close to the town but set back from the road beyond a small paddy field. The hotel was lovely, with a serene pool, and our first evening we ate at the onsite restaurant, which also included a Legong dance show from traditional Balinese dancing. We were also taken to the centre of Ubud, where we visited the Ubud Palace and had time to look at the markets. While seeing the traditional markets was very nice, everything does become very samey, with most of the stalls selling the same things over and over. It’s nice to have time to wander the streets of Ubud, but you don’t need to spend a very large amount of time here. For dinner the next evening, we asked our guides for a recommendation as they both lived quite locally to Ubud. They directed us to a restaurant called the Three Monkeys, which was within walking distance of our hotel. It also took us passed the Ubud Monkey Forest, and it was great to see the monkeys on the street as we walked past. The food at the Three Monkeys was amazing! A globally inspired menu with an eclectic mix of Mediterranean and Asian flavours, this meal was probably the best from our adventure across Bali. On leaving Ubud, we travelled North, first visiting the Tirta Empul Temple, a water temple near Tampaksiring dedicated to Vishnu. Famous for its holy water, we saw Balinese Hindus visiting the pools for purification. Following our first temple, we made our way to the event larger Besakih Temple, the largest, and most important temple for Balinese Hindus. Also known as the Mother Temple, it was amazing to see this huge temple complex on the side of the mountain. Of all the temples we visited during our trip, this was by far the grandest. Continuing North, we next visited Mount Batur, an active volcano situated alongside Lake Batur. We took the opportunity to have a buffet lunch at the Lakeview Restaurant. The food was pretty crap, but the views were spot on! That evening we arrived in Lovina, a coastal region in the North West side of Bali. On our way to the next hotel, we stopped at Singaraja, the former Dutch Capital of Bali, before checking into the Lovina Hotel. The Lovina itself is set back behind a large rice paddy field on the northern beach of Bali. Probably the most basic of all our hotels, but nice none the less. Our main reason for coming to Lovina was to watch the dolphins, so we had a very early start and headed to the beach the next morning where we jumped into our boats and headed out onto the water. Here we searched for the dolphins while watching the sun rise. While we didn’t see a huge amount of them, we did spot some playful dolphins chasing the boats along. We were told that they usually see much more, so it was a little disappointing, but we’re glad we saw a few. After dolphin spotting, we enjoyed breakfast before leaving for the sacred hot springs of Banjur. These springs were awesome, the water was so warm, and sitting beneath the waterfalls, letting the pressure of the water pummel your shoulders was so relaxing. One downside of the springs, however, is the sulphur in the water from the volcanic region. Expect your swim wear to be tainted yellow when you get out, and it won’t come out easily even after washing. The springs have some basic facilities for changing, just be sure to take some change for the lockers. We next travelled to the far North Western corner of Bali and checked into the Naya Gawana. This area of the island feels more natural than the other more touristy areas. On the edge of the West National Park, our room at the Naya Gawana consisted of a rustic hut complete with outdoor bathroom. Yes, we went to the toilet outside! I loved this place, it was very different but still really nice, and we had regular visits from Gary the gecko. We also spent our mornings having breakfast on the balcony of the restaurant while the staff chased away the monkeys venturing out from the National Park. If you’re looking for a true getaway then this area of Bali is where you need to be. We were also very close to Java, which saw some phenomenal thunder storms that we could watch into the late evening from our room. The next day, we headed out towards Menjangan Island for an afternoon snorkelling. I’d never been snorkelling before so I was a little nervous. Our instructor was amazing, but I just couldn’t quite get the hang of it. Feeling flustered, I wasn’t particularly enjoying it to start, but he helped me through and gave me my own little rubber ring so I felt a bit more secure, and before you knew it I was off! We made our way around the island as a group, looking at the coral and all the beautiful fish. At one point, I saw a turtle and followed it, until I realised I’d ended up nowhere near the island or the rest of the group and figured I should head back… Despite the chance of seeing reef sharks, I was out of luck, so that one is still on the bucket list for now, but maybe one day. Even though I clung to my rubber ring the entire time, I ended up really enjoying snorkelling and would love to be able to do it again. I was a little worried as some of the reviews said there was so much rubbish in the water you can’t see the fish, and I’m glad to say that even though there was a bit of waste dotted around, there wasn’t a lot, and it definitely didn’t spoil the experience. In fact, I think that snorkelling was one of the best experiences for me of the whole trip. 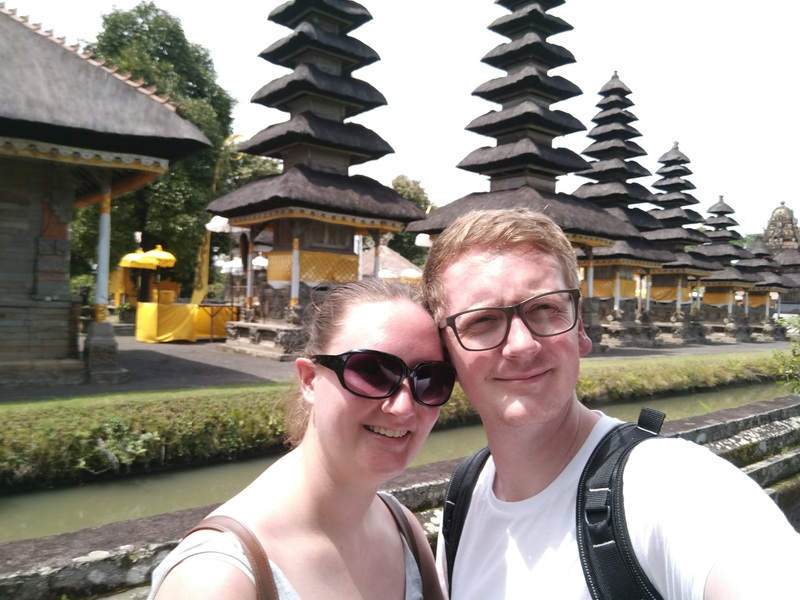 As we made our way back to central Ubud, our last day involved a few more stops. The first was the Taman Ayun temple, translated as a beautiful garden, located in the centre of Mengwi. We then moved on to the Alas Kedaton Monkey Forest. I’d been building myself up to this the entire time, half excited to see the monkeys, and half scared of being bitten and having the holiday ruined by the risk of rabies combined with poor local healthcare. Due to this, we ended up going round rather quickly, but to be honest, other than the monkeys there wasn’t much to see. I don’t know what I was expecting, but I think that also due to the lack of other people, the monkeys only had us to focus on, which made me super nervous. Arran had a bit of a visit, and annoyingly, I was so scared the photos I took were rubbish and out of focus, but he did get a fun video instead. Our last stop was Tanah Lot, a sea temple only accessible during low tide. This was the first time we’d literally seen hundreds of other tourists. Not sure we would get any decent pictures with so many people around, we tentatively headed down when the heavens opened and we were subjected to our first Balinese rain fall. Queue hundreds of tourists running for cover and we pretty much ended up with the place to ourselves, which was quite nice in the end. Our last hotel for the holiday was Segara Village in Denpasar. While it was a really nice hotel, by this point we just wanted to relax before the long journey home. Food was ok, but the service was very confusing. It was a buffet but we could only have certain stuff, which we didn’t really understand, but what we ended up with was nice. For our last day, before going back to the airport, we managed to squeeze in something I was hugely looking forward to. Taman Festival Park has been closed for years, and while reports vary on what actually happened, I was desperate to explore the site. So much so, I wrote a completely separate article related to the explore which you can read here.